Robert Durst Louisiana indictment: Gun, marijuana charges for documentary subject. 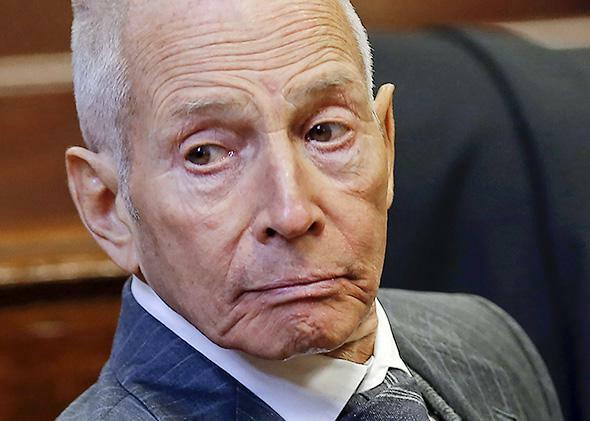 File photo: Robert Durst appears in a New York criminal courtroom on December 10, 2014. Accused murderer Robert Durst has been indicted by a Louisiana grand jury for weapons and drug possession and now formally faces charges related to materials allegedly found in his hotel room around the time of his March 14 arrest. Writes the AP: “A grand jury charged Durst with possession of a firearm by a felon, and possession of both a firearm and an illegal drug: 5 ounces of marijuana, said Assistant District Attorney Chris Bowman, spokesman for the district attorney.” His attorneys say the search of his hotel room was illegal. Durst’s attorneys have also said he would like to be extradited to California to face murder charges related to the 2000 death of a woman he knew named Susan Berman, but he can’t leave Louisiana until the charges against him there are resolved. Durst is being held without bail. Five ounces of marijuana, incidentally, is a lot of marijuana for someone presumed to be traveling alone—enough to roll about 200 average-sized joints.